Silent Site Sound Blocker lets you control which sites can shout at you. There’s nothing I hate more than autoplay audio and video when I land on a site. Yes, I know, “insert irony here,” but that’s why I’m certain you’ll love today’s tip about a new Chrome extension called Silent Site Sound Blocker (currently in public beta). Chrome and Firefox took a great first step by adding sound icons to tabs playing audio or video, and then giving us the ability to mute them. However, that still takes some effort, and really using a computer is all about automating repetitive tasks. I mean, why bother searching for that sound icon on one of numerous tabs when a Chrome extension can mute it for you? That’s exactly what Silent Site Sound Blocker does. Once you’ve installed the extension from the Chrome Web Store, it automatically mutes every tab in your browser—even if it's not playing a video. Now let’s say you land on a site that attempts to autoplay audio, be it from a sound file or a video. A pop-up will appear on that webpage with four colored options: always allow (whitelist site), allow once (prompt again), reject once (prompt again), or never allow (blacklist site). Select the option that’s appropriate for you, and you’re done. 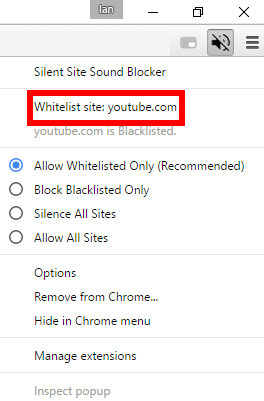 Silent Site Sound Blocker doesn't come with any preset whitelisted sites, meaning it'll be up to you to decide on each site as you come across it. At first, you’ll be making these decisions a lot, but as the extension saves your preferences this will become less of a burden. The default is to keep the site muted so at least you will never be surprised by a burst of sound—at least not one that comes out of Chrome. If you ever decide you want to change the status of a particular webpage, look for the large sound icon in your browser to the right of the address bar. Right-click the icon and select the Whitelist site: option at the top of the menu. Even though the extension mutes your tabs the regular audio controls will still work if you need to mute—or enable sound on—a tab on the fly. The extension’s menu also lets you set your preferences if you don’t want muting audio to be the default. To see the extension’s complete black- and whitelists, click Options. If Silent Site Sound Blocker doesn’t work for you type the following into your address bar: chrome://flags/#enable-tab-audio-muting. This is the option that shows the tab audio muting control. Click Enable and the extension should start working. You may have to reboot your browser to enable the feature. That’s all there is to Silent Site Sound Blocker. It’s a great little extension that just works.